The promotion of your food truck requires personal interaction with potential customers to create interest in your mobile food business. Since “potential customers” include current customers that may become repeat visitors, promotion can happen inside as well as outside of the truck. Try some of these tactics to promote your food truck business. Ask the chamber of commerce or the convention center for a list of contact information for organizations, such as service organizations, unions, political organizations, etc. Call them and tell them about your truck. Offer to cater their meetings and parties. Try to be on good terms with people who come in contact with tourists or big groups. Examples are hotel staff, concierge services, event coordinators at hotels or convention centers, tour guides, gas station attendants, car rental employees, etc. Any employee of your food truck can get involved with personal selling. Train your service window staff members as well as all of your on-board truck staff to engage in personal selling outside of the truck. Provide them with business cards or promotional materials, which they can distribute to prospective customers. You can speak personally with the human resources managers or appropriate personnel at any company that is in your local area to see if they are interested in setting up a truck stop on their property or having you cater a meeting or event. You can do this both inside and outside of the food truck. After customers finish their meal, it is never a bad idea for the owner or truck manager to speak with them, thanking them and asking if they were satisfied with everything. You can also follow up on customer service issues. For example, if customers fill out a comment card and leave negative comments, you could call them to apologize for their negative experience and offer to make up for it next time. Personally attend farmers markets, local arts or culinary festivals where you can vend or hand out samples. Talk to the event goers and tell them why they should try out your food truck. Even if you do not create any immediate sales, you will create awareness and get your truck’s name out there. Whenever you are talking to a prospective customer, show excitement about what you have to offer, but be easy-going. If they are not very receptive of your pitch, do not irritate them further. Any time you are in public, you should represent your mobile food business with your image. One way to do this is to use good body language. Make eye contact, smile and do not cross your arms. If you are talking to someone on the phone, smile while you are doing it, because the smile will come through in your voice. The more activities you are personally involved with, the more people you will meet. Almost every person you meet is a new potential customer. People are more receptive to promotional materials that come directly from a vendor. Instead of putting flyers on cars or stuffing them in mailboxes, try handing them out in person. Food truck vendors hear a lot of conflicting and confusing ideas about promoting their mobile food businesses. The key is growing your business organically and nurture your efforts. A good starting plan is to limit any promotional ideas that might devalue your food truck brand. 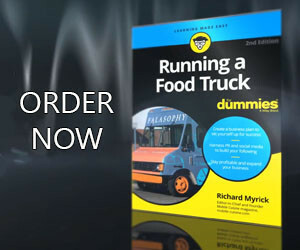 Build your food truck with a solid foundation and don’t create unattainable expectations from customers.